Volunteers from Million Voter Rising, the citizen group from Mahadevapura, interviewed candidates contesting in the Karnataka Assembly elections from Mahadevapura constituency. This is the transcript of the interview with the incumbent MLA from Bharatiya Janata Party, Aravinda Limbavali. Does Mahadevpura have any problems and what are they according to you? First of all, I want to thank organisations such as Whitefield Rising that are there in my constituency. They regularly come to me, we discuss various issues. Not only around the time of elections. Different issues at different times. As the MLA of this constituency, I want to thank all those who have cooperated. This time, like I’ve done previously, I called these organisations for a pre-manifesto discussion. Some of them attended, some of them didn’t. We broadly discussed some issues.I have published a Mahadevapura manifesto also. If anything is left out [from the manifesto], you can come back to me. Ultimately, we have to work together to develop this area. As you asked, Mahadevapura is developing area, it is not a developed core area like Jayanagar or Malleshwaram. In 2008, in Bengaluru, BMP has become BBMP – Bruhat Bengaluru Mahanagara Palike and 8 CMCs and 110 villages have been included in this area. It is the outer area of Bangalore and needs more development. That is why I called it a developing area. I have to work based on priorities here. The outer areas, Mahadevapura and Bangalore South are rapidly growing. Bangalore South has 5,25,000 voters and more than 9 lakh people living there. Mahadevapura has reached 5 lakh voters and 8 lakh population. Moving population is more than 15 lakhs because of software companies. It needs more focus. After discussion with the people of Mahadevapura, the issues have been divided into 5 parts in the manifesto. The issues are traffic, environment, basic infrastructure, law and order, and social empowerment with the participation of companies under the PPP model. We need to work on a priority basis. You described several problems. How many of these problems do you think are because the party governing the State is different from your party? I have published 2 books, because I am accountable to the people of Mahadevapura. In 2013, I have published what I did for the 5 years between 2008-2013. It is there on my website. 1,400 crores had been given to Mahadevapura in that term. In this term, the government has changed and I got only 798 crores. This is almost a 50% reduction. Besides that, they have taken back 71 crores from what I had got earlier. This is definitely discrimination as we are paying more tax but they are not giving more money to Mahadevapura. That is the issue. We should avoid politics like this, irrespective of which party [is governing]. It should be about the betterment of the people of the area, who have paid more tax. This is the duty of the government. I ask of the Chief Minister, at least 25% of the tax that has been collected in this area whether it is for the State or BBMP, it should be given back to this area. So would you say you were more effective as a Minister than as a member of the opposition? The role is different. In the first government, I was a Minister so I could pull more money. In this government, I am an opposition MLA. Compared to the MLAs of the other constituencies, I have been able to pull more money. So what will happen if the same happens again, and your party does not come into power? How will you do things differently? I will do things like I have done in this term. But I want to clear this, the Congress government will not come back. The people are tired. BJP will come back into power, I will be part of the government and I will use my position to improve Mahadevapura constituency. What are 5 things you will take up as priority immediately, if you come into power? Whatever pending issues are there from when we had formed the government (they’ve still kept that pending), for example, government hospital, digital library, market at Varthur, these have been pending for 5 years. In the first year, I want to take care of all this including road infrastructure. In the other 4 years, based on our manifesto, we’ll draw a timeline and work on it. As I’ve done earlier in both the terms, I want to create task forces. For villagers, I created Shaktikendra, through which I receive grievances and order meetings with officers, you might be aware of this. I will continue to do that. Mahadevapura provides 512 crores of taxes, how much of this is coming back to the people of this area? No, those figures are wrong. Around 1700 crores has been collected from the Mahadevapura division. Around 1700 crores for BBMP and another 2000 crores for the Karnataka government is the tax collected. I only got back 798 crores. Could you extract Central funds for common things like lakes and forests. No, you are aware of how the government functions. This is a Federal system. The Central government sends funds to the State government. P C Mohan and I met UDD officers with regard to Varthur and Bellandur lakes saying special grants must be given. We met Venkaiah Naidu to provide special grants as the State government is not ready to finance this. Unfortunately, there has been no proper proposal. Now it has gone under the Amruth scheme to the Central government. More money is coming to Karnataka. Apart from that, money is coming directly to BBMP and gram panchayats from the Central government. The administrators and representatives of that area have to plan how they spend that money. In terms of Railways, the Karnataka government made a mistake and made an agreement that 50% of the funds will come from State gov and the other 50% will come from the Center. Because of that, there is a delay. 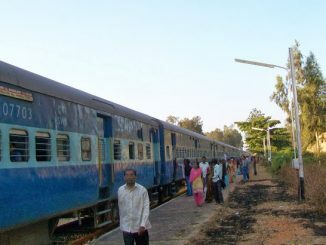 For example, after a long time, suburban trains have been announced and 17,000 crore has been given in the Central budget. Unfortunately, in the State budget, only 300 crores have been granted. Of course, it is only a question of one month, this government is going to change. Only then will the traffic situation will be addressed. Otherwise, it is a situation of havoc in this area. Some of them are smaller interventions, like the VIBGYOR road, Thubarahalli extension Road. Those people have been crying for 7-10 years now. What according to you can be done with respect to this? You are aware of the land issues. Seven times I have been to that road. The issue about the VIBGYOR school road is pending at the Supreme Court. Out of the court, I tried to convince that doctor. He agreed, went back and again said no. When Ramalinga Reddy was the Incharge Minister for Bengaluru, I took him also to that road and he also tried to reach an out of the court agreement, but [to no avail]. We have succeeded in creating a 20ft road near Thubarahalli village. But people like Saraab Reddy and others are coming in the way and saying they will not give up their land. Unfortunately, it is not a major road and doesn’t come under TDR. Under the new policy of the BDA, nobody will come for a TDR. We have to change those policies also. If people ask for acquisition compensation, BBMP doesn’t have the money to pay them. It is the same issue with the Kundalahalli junction. We have succeeded in bringing the sanction letter of compensation for land owners there, but the money is yet to come. If the cheques are issued soon, work can begin. What about issues related to public land and common facilities? Siddapura Park, the 2 acre park, biogas plant – this has not been approved yet. You have quoted 5-6 land issues. I can quote thousands. In my first regime, I was able to take back 277 acres of land that was encroached and reserve it for public purpose. This is printed in my first book. I want to process the garbage such that for each 2 wards, 1 garbage unit should be there. We wrote to the revenue department and they have identified that in 3-4 places, License Raj has created issues. From 5 years, I have been trying to get those lands. Processing companies are ready to join us, but BBMP is not willing. Is this problem only in Mahadevapura? Because it seems like things have improved in other constituencies. No, this problem is all around Bangalore. Some things have improved in other constituencies, some things have improved in Mahadevapura. What is the drastic change you want to bring about in administration? In Bengaluru, we need decentralised administration. There is only one Commissioner, how can he do the entire administration? Atleast 5 Commissioners are needed to provide relief. Whatever money has been collected here can be used here only. That is the functioning of the BBMP, let us talk about the functioning of the MLAs. No, for bifurcation also, the legislative should give permission. There was a trifurcation bill sent to the President. Do you support that? Trifurcation will not give results. Bringing members from a Council won’t give results. There are 224 MLAs in Karnataka. 1 Council is enough. Administration should be decentralised. 5 Commissioners should come. I have had bad experiences with going to the head office of BBMP. I have created a task force for each department. It goes from BBMP to a Committee, from the Committee to the Commissioner. The whole process gets delayed. Can you explain how as part of the 2008 manifesto, you created this task force and managed it? In 2008, I did this on a trial basis. R K Mishra was the Chairman for the task force for Bengaluru, and we created sub committees under that. In 2013, we created groups of the departments. For example, service dept, infrastructure dept, resource generating dept, and PPP model CSR funds. We have provided training for the groups for 2 days in a resort in Hoskote. Experts taught them how to handle the departments. Unfortunately, with this government, the task force members have made a lot of proposals and follow-ups, but they are unhappy with the government and the bureaucrats. Who is there currently in this task force? There are more than 100 people who have been trained by experts such as retired IAS officers, politicians, ex-MLAs. Are there residents of Mahadevapura on the task force? And where is the list of these people? Yes, people from Mahadevapura only. We can provide a list of the task force. Jayachandra Reddy has coordinated this work. My office will provide you the list. We have conducted a training camp and for the whole two days, I was with them. How did you decide what was a priority in spending the MLA LAD funds? Because we see that out of the 10 crores, 50% has been spent on bus shelters. How did you prioritise what is important and not spend these funds on drinking water or toilets? Mahadevapura is a big constituency. For other constituencies in Karnataka, there is an average of 2 lakh voters. As I mentioned earlier, there are 5 lakh voters and 8 lakh people living here. It starts from behind Central jail and ends behind the International airport. 8 BBMP wards, 6 Jilla Panchayats and 11 Gram Panchayats are there. In a ward like Bellandur, there are more than 1 lakh voters. So, priority is infrastructure. I have not given priority for bus shelters, but rather bus shelters in rural areas. Because they don’t know where the bus should stop, where the people will stand. You will find more bus shelters in the rural areas of my constituency. Fortunately, with the PPP model and CSR funds, my MLA LAD and Huawei has been kind enough to grant their money, we have started water projects also. We have installed 34 drinking water RO plants, in areas where poor people are living. The other part, not from my MLA LAD, but we have built toilets in government schools, especially for girl students. Because where toilets were there, there used to be no water. In 127 primary schools, we have installed toilets through the PPP model. Even in High schools. I think we need more CCTVs. There is a rule in the MLA LADs, per year I can’t give more than 30 lakhs towards one issue. Over two years, I have given 60 lakhs towards CCTVs. I have not given money only for bus shelters, I want to make it clear, I have provided for primary schools, drinking water and CCTVs. About maintenance plan for CCTVs (not audible) – through neighbourhood watch programme..
After your person met me, I gave a suggestion to the Police dept. Don’t put substandard CCTVs. I don’t want to control traffic through CCTVs. It is not visible alos. Instead, use CCTVs for security purpose. They have amended it. There has been a lot of unplanned growth and new buildings everywhere. But we don’t have the infrastructure to support this growth in place. Roads and water aren’t available. Would you say that there should be no more sanctions for new buildings until infrastructure improves? Everytime a building has collapsed in my area in the last 5 years (3 times), I have written to the BBMP and even the Commissioner asking why they are giving permission sitting in the head office. What is the use? There is no proper foundation. People are greedy. Because this is in the software hub, they want to live close to their offices and avoid traffic. They have violated all the rules. 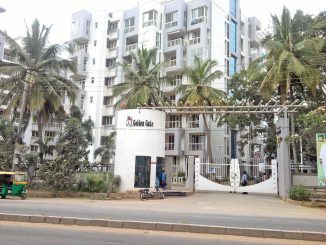 The outer Bengaluru area, particularly Mahadevapura and Bangalore South, the permission is different for the buildings here and the built up, too is very different. Several times I wrote about this. Unfortunately, BBMP and the Government is not in our hands. Though we are big in number compared to the ruling party’s number, they have come into power in an indirect way and you all are aware of that. So we are unable to insist all those things. Let me rephrase that question. Not for people who have done violations… [will you support the policy] no new constructions, till we have everything in place? No No, I support it. Because the bureaucracy will agree my decision or not, I do not know. I have not raised this issue only for Mahadevapura, I have raised this issue for entire Bengaluru. Why do we want to expand Bengaluru more? Let satellite towns come. We should connect these through rail or buses instead of bringing everything to Bengaluru. And I even suggested the Home Minister, the Transport Minister to put a condition like they have put in Singapore. If anybody wants to purchase a car, the tax should be more. The cost of the car should be 4 times more than that. Then only traffic will come under control. But the Government is not ready for that. I don’t know about our Government also, whether they will agree to this or not. People cannot live in any apartment without OC. It is a violation of KMCA. Why is this not taken on a case to case basis? No, that’s why we should work together. The corporator, the MLA, the MP. If I am insisting, if other party corporator, after the elections, we should leave the idea of the party lines and work as a team. Then only things will improve. I am saying for not allowing without NOC inside. If an opposition member of the corporation is saying “Let him go inside. What can the MLA do?”- then this is not a good spirit. Even for encroachment also. But is this put on paper saying that BJP believes in no occupancy without NOC. If that stand is taken clear, then all your BJP members actually endorse that, then we will reach a conclusion officially. Ya ya, we will do that. From the BJP side, I can ensure that. And one minute, if the officer is not going to give a NoC within the prescribed time and if he creates a problem unnecessarily for not giving him a bribe, that is also another issue. So he has to issue the NoC if the building is complete. Else what will be the fate of the builder who has invested there- all these issues are involved in it. Definitely I am for that and I will ask my corporators, i’ll advise them to not encourage such things. yes I told you about this. Otherwise, give reasons for not giving [OC]. We need to have a brainstorming session about this. We need to call builders, we need to call our bureaucrats, we need to call the clients. We should have a session as there are so many issues. The Central Government has put some rules, the State Government has put some rules. So win-win situation should be there. We need to discuss about this. But as he rightly pointed out, about this, I am of the opinion that without NoC, nobody should sell the property. On the question which are being brought in the Assembly, you are aware that the current minor irrigation work was passed (a violation of the NGT). So why didn’t you bring about any questions on this issue? I’ve raised this issue. I have protested here about those Kolar line, and both those lakes belongs to BDA. As I said, if you go through the BDA CDP, there also I protested. I wrote a letter and gave a presentation in the Press Conference about the new CDP. Say for example, In Varthur, others said they were sold. The NGT order was 75 metre and the media itself showed the road. So I said this is a conspiracy. Somebody wanted a road here and that’s why they asked the minor irrigation to put the pipe on the tank bund of Varthur Lake. You’ve created a pipeline near Kempapura with the pillar. Why is this not possible with the Varthur Lake? I suggested this. I visited the spot 3-4 times. We had a protest also and we had 3-4 meetings with the Minister incharge of Kolar. An unfortunate thing with this Government is, the minor irrigation minister did not take any initiative about this. The incharge minister of Kolar had a meeting on this due to my insistence and I attended this and then he was saying that he came all the way from there for inspection. I said “This is a civil work”. And on Varthur, you cannot run your pipeline, it is a NGT order and you want to create a pipeline and make a road there. Take the pillar and make the pipeline. I am not against Kolar taking water from here but you should not spoil our environment here. This was the argument. The other day, he has given a statement that whoever comes in between, whoever is going to stop this, I will place a tulasi plant over their grave and take the pipeline. Being a minister, he says such things. He wants to put a plant over the graveyard and build the pipeline. This is statement he has made in front of the corporator of Hagadur and he is very co-operative about this project it seems. This is the history of it. Last month, The Karnataka Lake Development and Conservation Authority, in the legislature, has been handed over to Tank Authority. Every lake of Karnataka has been given to minor irrigation. So, knowing the history that MI has not protected, and you have protested against it… it was adopted universally in the legislature. We do not see anybody who objected to it. We all raised this issue in the house, The Government answer was that – Some lakes belong to the BDA, some lakes belong BBMP, some lakes belong to the corporations of different areas. We want to bring all the lakes under the umbrella of minor irrigation. This is the answer. And we want to improve the minor irrigation tanks. No, the thinking is right. I’m telling you, giving the money from the Government, they will get money to improve the lakes is a different issue. But bringing all the lakes under the umbrella of minor irrigation, we are for it. The definition has changed as a tank which will make it weaker in the law. Ya, they are changing the definitions. There are two provisions of this law. One as far as we understand it in seeing the geo, citizen participation which in your constituency is the highest as you see lake all of us are working on it. (yes, yes). That is diluted. Citizen participation is diluted. Second, for public good it is allowed to do some public work meaning, they can put up roads it seems, which was not there in the LDA. 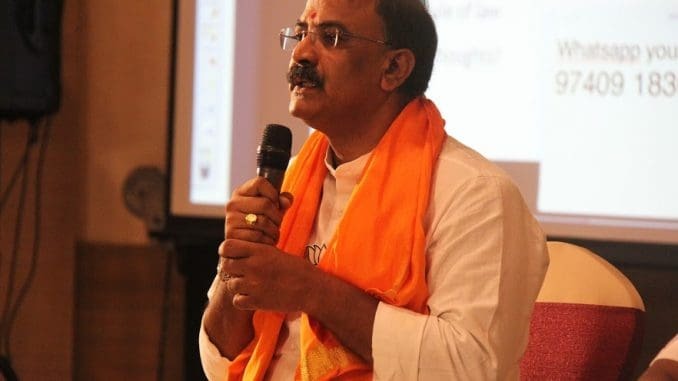 No no, you all aware that Rajeev Chandrasekhar is fighting for the lakes and NGT and he is a part of BJP and he will definitely, if like what she says, will amend that if our Government comes back. Without any public participation, can I go develop all the 76 lakes of my constituency? Is it possible as a MLA? Not possible. It is the duty of the local citizens and we need to ask them for the maintenance. After developing the lake, we need to create associations and we need to strengthen them because as I said, one of my issue is the environment- we need to protect the environment. It is a question of 75 mts or 30mts . In other cities of the countries, it is 30mts. That is a NGT issue. Let them decide. About the participation of the citizens, we are for it. What about the “For public good”? Then why was there no opposition in the Assembly that day without any debate? It was opposed. Unfortunately, the Government did not hear this. Bringing this under an umbrella, we supported this. Bringing it under one organisation, that is good. Because, from my experience, the Varthur and Bellandur lakes, in the first regime what the bureaucrats have done is that they have said that it should be developed by the BBMP. The BBMP has made an estimation. Then BBMP said that they don’t have the money. Then they sent it to the BDA. The BDA has called several meetings. They called IISc scientists as to how to develop these lakes. They’ve prepared a DPR, then they said we don’t have money. Again, they sent it back to the BBMP. This was going on for five years. Instead of that, in my opinion, they should bring it under one umbrella which is good. As per the catchment area of the lake, let them allot the money for the development. That is okay but couple of points. So far the BBMP has been the most productive in the last 10 years. Because of BBMP, more lakes have been rejuvenated in your area more than BDA, more than MI, more than anything. MI has a history of these kinds of pipelines, violations that are happening in these lakes. So, the Lake Development and Conservation Authority had very strong clause. And if we adjust it..
No no, the Lake Authority will come under minority irrigation. So then we’ve created one more layer of bureaucracy..
No no, earlier what happened is..
Actually, one more point that you can address- minor irrigation does not have expertise in urban lake development. They’ve not had it so far and if you look at all the people, they are all engineers. So we feel that that actually being on the Lake Development Authority would have been better because they have urban sewage coming in, car battery fluids- all kinds of things that MI doesn’t have. So is there any possibility that you can address that? Is there any possibility where you will rethink this and say whichever departments should have the expertise in urban vs rural areas? After bringing this under one umbrella in the minor irrigation department, the department has every right to outsource their property to the Government. If at all this provision is not there, we will make the provision. Say for example, you say about the BBMP area, the BBMP can develop those lakes under them. They can go MOU with the Minor Irrigation. Like in Belgaum, they can go with Belgaum. Like we’ve developed, you all have cooperated for several lakes. The other CSR funds have been brought to them. When Minor Irrigation can go for MOU with the local citizens, organisations like you. These other organisations can also mobilise the funds with the matching grant to the BBMP or the State Government, they can improve the lakes. That provision we should make. If it is not there, I’ll definitely fight for that. Another issue, I don’t know if you’ve noticed or not, again and again I’m writing to the Government and I tell them in the meetings also, in the RWA meetings also, only I have raised this issue about the Golf (course). It is a lake and it has not been given to the Lake Authority. It comes under the Revenue Department. As per the Supreme Court order, it has not been handed over to the tourism department. The Government has done this illegally. I’m asking them to give back my lake, remove your golf from it. There’s a big lobby, nobody has supported me. In the coming days, please support me about such issues. We’ve repeatedly brought to your notice attention about corruption and local BBMP offices. Lack of enforcement and other such practices simply do not work here. What kind of intervention have you done and what is your plan to ensure corruption free planned approval for the OC, BWSSB, BESCOM connections and others and so on? For Khatha and such issues, again and again I told the officers that I wanted Khata Mela where you need not pay money and they have to issue a khata. This I will implement after the elections definitely. I insisted this to the Joint Commissioner several times. The issues related to the land is different and they have to resolved. The Government has to make an amendment where such lands are there. Apart from that, corruption is the main issue in Karnataka. Even Prime Minister said this.There is 105 or 20% corruption here. Unfortunately, the Kidzee school issue is also related to corruption. The police officer took money from the school and didn’t book a case for which I protested and I’m facing the case now instead of the school management. This, again is corruption. I do agree that we have to fight against corruption as a society, definitely I believe in that. There are several instances where citizens have gone trying to file FIRs on different issues and we are not finding whether it is a case of women against whom crimes have happened and the Police have always tried to tell us that they will solve us. And even that Kaikondrahalli lake buffer zone violation, 71 people went to the police and we also called your office for support and we didn’t get anywhere in that. Police refused to take the FIRs. That’s what I am saying. But [law and order] under you, what can you do to change it? I protested against Bellandur Lake and they put a case against me. I had a rasta roko near Iblur junction. For such cases, I spoke to the officers several times and unnecessarily innocent people were involved. I banged them. In some cases, they’ve taken the action and in some cases, because of the higher authorities’ influence or maybe because they’re involved with the money, they have not taken action against them. So, The Government has to change madam. If proper guard or boss is there, then only people will come in to the line. See, for example I’m telling you about the Kidzee school, I am with the Chief Minister for four programs in my constituency and I used to conduct all the officers’ meeting where the officers who have put case against me were present. Unfortunately what he has reported to the court is that I am absconding. I am not telling about that. I’m talking about the mentality of the boss. If the person sits there and maybe belongs to the Congress Party, if the right person is there then he can improve his department. That I’m telling. I’m not against any party. Yes, definitely we’ll do it. Officially, we started that in our government, for example, in Sakala. Such programs they’ve started where we can get immediate information and in my constituency, I’m practising it. This is the accountability what (51:57) Maybe you’ve got this book , this is the second book. Earlier also, I did the same thing. Each item is there. For example, which ward, what is the work, whose department, what is the amount. So accountability should be there. Definitely we insist for that. Not only the IT city, but the whole of Karnataka. Digitally, every citizen should be empowered with the data. No, this is fag end of my tenure, but apart from that I used to put everything on my Facebook profile. This is the amount, this is the work and I’m going for a land (52:50) ceremony on so and so date. Ya, you’ve raised a very good point. Even when I was the Higher Education Minister, I brought it every year. The Government is bringing for each department as to what is their budget, what was their expenditure this year and what is the left out amount that will be given as a spill over at the time before the budget of the next year. So as you rightly pointed out, it should appear in the official websites of the Government. This is a good suggestion and I will definitely suggest this. Its there on the papers but it should also be accessible to the people, it should be transcribed. We noticed that you raised questions related to higher education, but specifically related to Mahadevapura, the list of questions that you raised about Bellandur and others in the Assembly. Is that the list and the responses that the Government has shared. Is that something you can share with us? That would be very useful for us, so that we know that our MLA has taken this to the Assembly. Ya, in the questions session , I raised these issues. Apart from that, in different calling attentions and three Action 69… I’ve raised these issues and the answers will be given by the Government that all you will get. Just to add to this transparency issue that she was talking about, we have 8 wards in the constituency. Why is the ward committee not functioning effectively because that is the means where citizens are getting engaged and that’s why it was set up for that transparency level. So we don’t see that happening and some of them are BJP corporators. So, why is not happening and what difference will you make to ensure that it will happen? The problem is with the BBMP head council. They’ve made different committees. I bashed them in one of the meetings as to why the town planning committee should come to Mahadevapura and if they will they stop any illegal buildings here or do they want money from the builders. Why only Mahadevapura? Why not Peenya or Mysore Road? That’s because they don’t get money. If the ward committees are active ,it will be problem for the members of the committees. Definitely, as you rightly pointed out, we need to give more empowerment to these committees. Instead of that, making a committee at the head office level, ward level,they can analyse everything. Every council will have its own committee but what committees are active? That’s what I’m telling you, instead of that, we have to empower these committees. We have to give more power to these committees whichever party they belong to. Right now full powers are there in any committee sir. The 74th Amendment, they haven’t even instituted ward committee in many wards. It’s not implemented no. The Act has been passed but the problem is, the corporator initiative should be there. (murmurs) I can influence my party, I can advise them. But the thing is, ultimately it depends upon the person. So you’re saying your party corporators have not been able to help you? Here in my constituency they are ready to help. So, then why hasn’t it been done? We’ll do it. Wherever the corrections are necessary, we’ll do it. Reg: Bellandur area What did you, as an MLA for this constituency, approach BWSSB, for clean water and the basic amenities like sewage. When we approach, personally, we are given arrogant answers like- we will come whenever we want. You can respond for both the terms- 2008 to 2013 and 2013-2018 both your initiatives. No, no. Who has responded like this? Let me come to your question. The first question you raised, I told you about it. Basic infrastructure and infrastructure. This is a developing area. I said the BBMP had been included in the first phase. In the CMC area, we got Cauvery water and UGD. Maybe you are aware of it. In my area, I blacklisted the contractor in the first phase 1 that is in Mahadevapura CMC area. We’ve changed the contractor also who was doing a substandard work. Now the second phase has started. Work has started already and the raise of Cauvery water of 110 villages. The work has started and they’ve started building the pipelines for the Cauvery and UGD lines. We all went to Venkaiah Naidu to change the priority. JICA has to give the guarantee for that. We requested Venkaiah Naidu and fortunately he has changed the priority from 17 to number 2. That’s why these 110 villages are getting a grant from JICA to bring Cauvery water to their houses and UGD to your house. And fortunately, Dharmendra Pradhan has granted gas license. All the three works are going on in the 91 out of the 110 villages of my constituency. I have a follow up on this. All of us are getting water. The Government is not giving any water. I live in Bellandur in Kaikondrahalli. When there is water, if you’re only focussing on Cauvery, we are not exploring everything because water is coming to us, we are paying privately. Why can’t this be streamlined by the Government and say lifeline water for everybody at a rack rate will be provided because I am getting the water from the tanker. Why can’t the Government get the water from the tanker and give it to me and say 100 litres per person, per house. After that if you use it, excessive charges will be applied. Why do we need Cauvery pipeline? I do agree with that. But now it is decided that Cauvery should be given to everybody. That is for later. We are talking about now. The work is on, I’m telling you. We are saying we do not care if there is a pipe or not, will you look into something saying it doesn’t matter what method in which the Government gets the water because for a citizen, it doesn’t matter. For us, what matters is, when we open our tap, lifeline water should come which is 100 litres should be the basic minimum per person and the Government should provide and we are asking for your support. Currently, we are getting only 20% of our water from Cauvery. Yes yes, I do agree with you because you all aware that this is like a garbage lobby. So water lobby is also there. They want to stop this and make the work slow is because of that. They’ve got many tankers and in fact, in the summer season, we used to ban the selling of water. BWSSB used to take all the tankers . We should nationalise all the tankers now, in the coming days and we have to make a very strong effort for that. You buy the water from them and give it to us. It would be better than us buying it for ourselves. This is like a controlled shop. Should I say something in Hindi also? (yes yes). There are people who don’t know English and Kannada here. (In Hindi) There are a lot of people here who speak other languages. We have to deliver services to them also and that is our duty. I am trying to do this for 10 years now with water, electricity, with streets and roads. It is our duty to deliver these services to them. Apart from that, we also have to maintain the environment of this area. This is the duty of them (citizens) and also the duty of the Government. We’ll involve everybody and do all these in the coming days. There is an important point in SWM that’s not been covered. The DWCC is not there in any ward Sir. It is a very big problem and the SWMRT group is very concerned. You have 4 wards in the constituency, why have you ignored this? 4 wards that are BJP. I will insist for all the eight wards. Very good Sir. mandated by the high court. Why is it not there sir? We’ll do it. Because you know that we inspected in land also. That land is run by Bangladeshis. I said how can you run it? You are aware that you only said about these and we’ve given a proposal to Sarfaraz Khan and he has replied that he is at it. Instead of that giving this land, he is dumping the entire material, the garbage in my quarry. Technically, he stopped in Mitiganahalli. He’s putting it in Balahalli. Balahalli is in the next village of the same quarry. And it belongs to Krishna Byre Gowda. And leachate is coming to my lake. How can you stop that here? … because we are talking only about dry waste and not the other 5 types of waste. No you have lot of ideas and definitely we’ll meet after the elections and you know that for the past ten years, I am active and in the coming years also I will be active even though I’m in the Government. So my constituency is also my priority and definitely we’ll sit and discuss all these issues and we’ll resolve these issues. Thank you very much! Sir, you mentioned the water lobby. So, in this new term will you commit to ensuring there is no water lobby or anything. The agitation is for us. We will agitate, you give us results. No, no we stopped it. That’s what I’m telling you. Who is owning the UGD in Bellandur? According to BWSSB, no. Who is owning it? We want the answer Sir. I’m telling you that it is BWSSB. (In Hindi) if they (BWSSB) denies it, tell me. I will resolve it after the elections. Each ward committee should have at least three representatives of apartment associations in the respective wards. Apartments should not be treated as bulk but as individual, demands the wishlist. Bengaluru needs better railway network, because trains are cheaper and faster than any other mode of public transport. 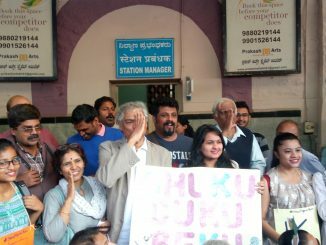 Namma Railu citizens ask you to support the Namma Railu campaign today! Sir we on Sarjapur Road facing lot of problems regarding cauvery water road widening traffic but you have not mentioned about this. Also u r inaccessible.